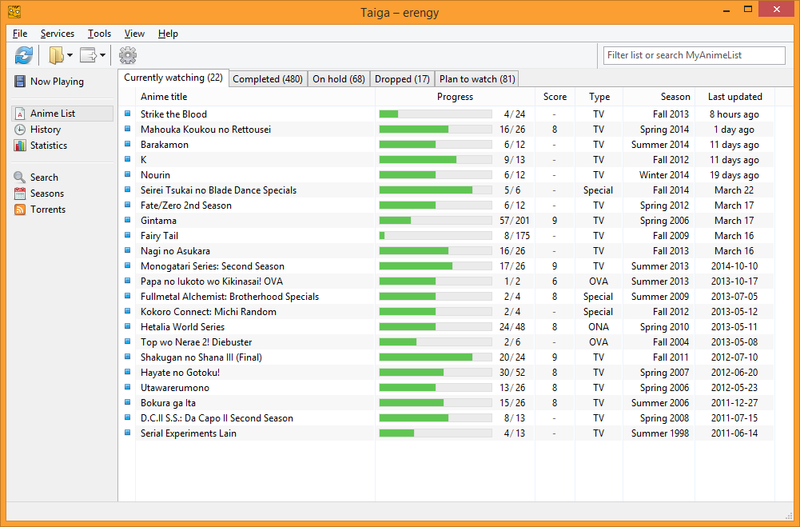 Taiga is an open-source desktop application for Windows. It automatically detects the anime videos you watch on your computer and synchronizes your progress with AniList. It helps you manage your anime library, discover new series, share watched episodes and download new ones. I am pleased to announce that Taiga is now available with AniList support. For those who don't know, Taiga actually predates AniList--it's been around since 2008--but previously it focused on MyAnimeList only. v1.3 is currently in beta period, which means that some features might be a bit rough around the edges. Let me know if you encounter any issues! Custom lists won't be supported for the time being. 10.0-point and 100-point score systems aren't fully supported yet, but they will be before the beta period ends. Hi! I'm running into an issue with Anilist and Taiga. Whenever I try to update my Anilist with Taiga, nothing happens, and I get a message saying "Anilist returned an error: Internal Server Error", which means that Taiga is unusable with Anilist for me at least. This seems like the best place to report this issue. Hi there Ed. The error message points to an issue with AniList's server. Assuming that it wasn't a temporary one, it might be an edge case in the API that prevents you from updating your list. What's the thing that Taiga is trying to send to AniList? You should be able to see it at the History page, at the bottom of "Queued for update" section. So while the History section is completely empty, I guess it was trying to download the anime list. Thanks for the details. I'm assuming that you authorized Taiga to access your account too, after switching the active service to AniList. It seems AniList's server is somehow failing to respond to you while Taiga's trying to download your list. Since the issue doesn't affect other users, I'm inclined to think that it's related to an entry in your list. Yet I'm able to download your list from Taiga without any errors. Do you have any private entries? Perhaps one of them could be the cause. That's interesting. I do not, in fact, have any private entries. In fact I don't even know how i'd make one, so I highly doubt I did it accidentally or anything. Thanks for the continued help! Did you manage to fix this issue? If so please tell me how as I have the exact same problem. I imported my list from MAL because of the recent API problem and would very much like to switch over to anilist. Log shows a bunch of : "2018-05-27 13:55:11 [Error] anime_db.cpp:211 anime::Database::FindItem | Could not find ID: 160" with different ID. I can add an anime from taiga directly and it does indeed get added when I check on my account from the website. When I try adding anime that are already on my list from the import, they do show up on taiga so that could be considered a workaround but adding over 300 entries isn't very realistic/efficient. Fixed by not being stupid, aka putting my anilist nickname instead of my email adress. Oh my god thank you so much lmao. I've been following the AniList support issue on GitHub for a while, I'm glad to see some longstanding members of the anime community coming to support AniList. As a long time user of both Taiga and AniList, thank you so much! Taiga is life, Taiga is love. Even though so far I haven't used the RSS .torrent Download for other than testing purposes, and that's only because I'm used to do it within qBittorrent already, I might make the switch eventually. Thank you so much @erengy! Hi! I had shows marked as "Paused" or "Planning" on AniList. While cleaning up my anime list, I moved some shows around and deleted others. Taiga's synchronize was unable to detect the deleted shows but correctly handled the moved shows. I was able to fix it by deleting the saved data in %APPDATA%. Is this a known issue? Hi there, and thanks for the report. I think I know what the issue is. I'll try to fix it in the next release. Does Taiga ever plan to include Manga List? I remember not using your service for so long because the lack of a Manga List support. Eventually. But I'm afraid it's still not among the short-term goals. when I search for torrents the program automatically selects the same episode multiple times to download - do i need a specific filter or sth? Yes, you need to set up some filters according to your preferences. See the support page for some information on how torrent filters work. Tokyo Toshokan is the default feed simply because it's been the most stable one. Feel free to switch to another feed if you want. How is it supposed to know which fansub groups and video resolutions you prefer? :) You can disable the default general filters (e.g. "Select currently watching") and create individual filters for the series you'd like to download. While I absolutely love Taiga (thanks for your hard work!) I found one issue that I can't find a solution for. Now the problem is, this download folder is never set in the torrent program. sets the download folder to the one set in Taiga settings. The anime folders do get created though, but obviously they stay empty..
With deluge I saw an option to "move the files to folder x after downloading" but that isn't automatically set either. what torrent software are you using? I'll try that one then, thanks! Looking through the code, it seems like qbittorrent is the least "hackery" option on windows. Both Transmission and deluge rely on console programs, maybe the issue was that the filetype was associated with the gui executable, not the console one. But since my favourite one, tixati, doesn't work yet anyway, I'll try out qbittorrent! Thanks for your input! It has been a few weeks, and I can’t update my anime list at all. I think it’s taiga problem, all 3 of the site is not functioning in the app. MyAnimeList disabled their API more than two weeks ago. It's currently not possible to use Taiga or any other application to update your MAL account. You're supposed to enter your Kitsu username rather than your display name. It's shown as "Profile URL" in your Kitsu settings. This distinction was recently introduced by Kitsu. The next version of Taiga will ask for your email address instead. You're supposed to enter your AniList username rather than your email address. Taiga's settings dialog specifically mentions this. Hi! In my Completed anime list, there are some anime that marked as "Currently airing" although anilist tells otherwise. For example, Danganronpa, Kamisama no Inai Nichiyoubi and Neptune the Animation. Hi there. Apparently those series were missing their end dates in AniList's database. I submitted changes for them now. Should be fixed when they're accepted. Ah I see, I didn't think of that. Thanks! Mind adding support for synchronization between multiple platforms? It's very difficult to get this right. Building a map of all anime between services, handling inconsistencies and keeping things up-to-date requires a great deal of development time and additional human effort. It'd be great to have this feature in Taiga, and we've given a lot of thought into it. However, it's not a feasible feature to work on at the moment. Note that Kitsu is able to automatically sync your library updates to MyAnimeList. Visit the Settings → Export page to set it up. Does Taiga support moving an episode viewed from a root folder into the appropriate show sub-folder? If there is currently no such feature would it be possible to add it in the future? Taiga cannot move files by itself, but it can tell your torrent client where to download. Note that only a few applications (Deluge, qBittorrent, Transmission, uTorrent) support this. Could you have it work with custom anime lists? I have a few plan to watch anime that I keep in a separate list for example (sequels), and those don't show up in taiga at all. It would still be fine even if they all were in the planning section without distinctions. "For now, I don't plan on implementing service-specific features (e.g. custom lists for AniList, media reactions for Kitsu). But I'll reconsider in future versions of Taiga." As I said it would be fine if they showed up under their normal list. They most definitely do not, unless it’s because I hide them on the original lists and have them only show up in my customs. See my last post at erengy/taiga#590. You can try the latest build to see if it fixes your issue. Hi, I'm encountering a problem similar to one of the first problems on this forum. I'm getting the "Anilist returned an error: Internal Server Error" problem. However the fix to that seemed to be because an email address was used, not a username. I'm using my user name and it's still happening. I recently imported my anime over from MAL to anilist, switched services over to anilist and authorized my account. 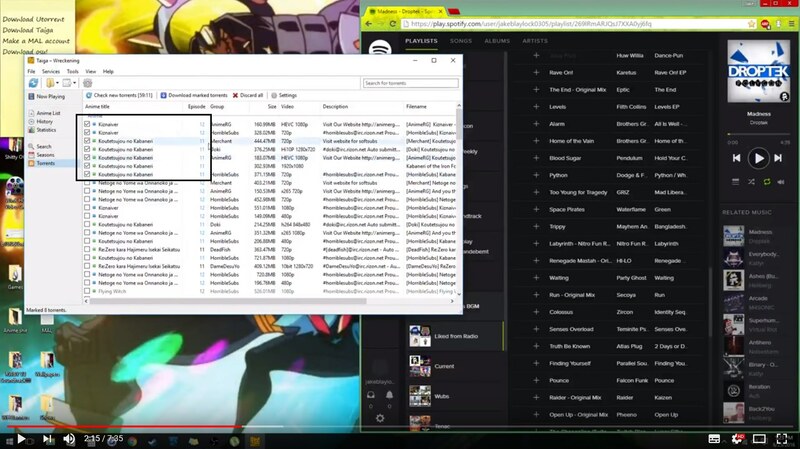 It synced and successfully downloaded my anime list. The problem starts when i have finished watching an episode and update the episode count on taiga, it queues it up and returns the error "Anilist returned an error: Internal Server Error" and does not update. However i can get it to update on the anilist site, but not on taiga, using taiga by doing the following. This will update my anilist profile once. For example if i click the + twice, it will only update the first episode, or if i update two different anime episode counts, only the first one i did will be updated on anilst. However it does not update on taiga and still stays in the queue. So to update a second episode i have to delete the history, sync and +1 again. I think i have done something wrong and not sure how to get it working properly. Hi there. This is actually a problem with AniList itself, which is why you're getting an Internal Server Error. I recently figured out the cause and reported it, though it hasn't been fixed yet. See this page for more information. Downloading the latest build should solve your problem. Thank you. It's working now. The latest build did fix the problem, although I was sure I was already on it as I re-downloaded taiga before switching everything over to anilist. But I did it again and it seems to be all good now.